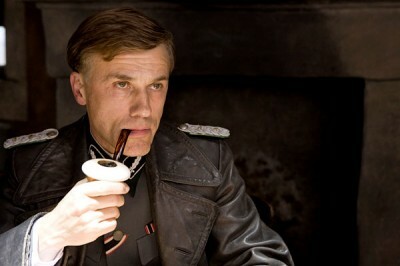 "Inglourious Basterds" isn't a World War II movie, it's a Quentin Tarantino World War II movie. Turning his fiendish screen alchemy to the combat genre, "Basterds" slides perfectly in line with the rest of Tarantino's funky filmography, returning stupendous dialogue, dense plotting, anachronistic soundtrack selection, and fire-breathing performances to the screen. Perhaps not as whirlwind as the marketing suggests, "Basterds" heads elsewhere for inspiration, finding the art of intimidation and espionage even more thrilling than straightaway slaughter. It's a patient, layered, stupefying doozy of a motion picture. Once again Tarantino has come to bend the staples of cinema, and the results are characteristically spectacular. 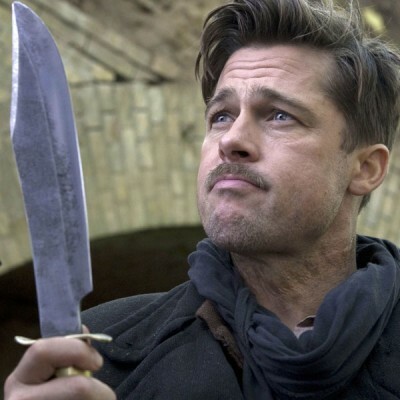 Once upon a time in Nazi-occupied France, Lt. Aldo Raine (Brad Pitt) has assembled a team of Jewish soldiers to set out and kill (and scalp) as many German troops as possible. Working through the country killing Nazis and collecting intelligence, the "Basterds" find their way to spy Bridget von Hammersmark (Diane Kruger), who offers info on a Third Reich film premiere to be held at the Le Gamarr Theater, located in a remote corner of Paris. The owner of the theater is Shoshanna Dreyfus (Melanie Laurent), a young Jewish girl who years earlier watched the slaughter of her family at the hands of "The Jew Hunter," Nazi officer Col. Hans Landa (Christoph Waltz). When word of the premiere, and the attendance of top Nazi officials, including Hitler (Martin Wuttke), reaches Raine, he sets a plan in motion to infiltrate and bomb the theater, effectively wiping out German command. Inspired by the 1978 Enzo Castellari film, "Inglorious Bastards," the crudely retitled "Basterds" offers Tarantino a wartime palette from which to paint his latest masterpiece. One can sense the vein-popping determination from the filmmaker to make sure every single frame of this film remains to his liking; it's a picture of intricate cinematic details and cold, chilling responses. Tarantino uses men-on-a-mission plotting to spin off into wildly different directions, some richly theatrical, while others remain potently visual, gleefully imagined by a resourceful filmmaker who loves the electric charge of subversion. However, to get to the roaring Nazi inferno, one must be very patient with Tarantino. Hinting with 2007's "Death Proof" that his tastes might be swinging from the visceral to the verbose, "Basterds" indulges in long stretches of nerve-racking conversation between the innocent and the Nazi. The Landa character is primarily made up of predatory small talk, coaxing his victims in with warm conversation and an askew smile, only to set them up for the kill. "Basterds" plays very literary, with chapters listed onscreen to divide the story and a host of flamboyant characters all vying for personal satisfaction in their own hyper-violent ways. The lure is in the language; Tarantino tinkers with accents and syntax, even allowing a majority of the film to be presented in French and German. In a way, it's the director filling out a "to do" list of artistic endeavors. If "Kill Bill" was his kung-fu saga, "Death Proof" his grindhouse offering, and "Jackie Brown" his blaxsploitation masterwork, "Inglourious Basterds" is his highfalutin foreign film epic, romping around subtitles, cinema palaces, and voluminous, lingering exchanges of duty. This is not something shot out of a cannon. "Basterds" crawls along the floor with gradual determination, expanding the suspense with every last shallow smile and twitch of an eye, communicating the coming storm masterfully. It's something of a shock to find "Basterds" not really about the Basterds at all. Pitt and the gang (including Samm Levine, B.J. Novak, and Eli Roth -- who acts about as well as he directs) are only one part of the story, though watching Pitt merrily stomp around as Raine makes their screentime much too fleeting. With a Tennessee drawl and a slash scar around his throat, Pitt looks like he's having the time of his life as "Aldo the Apache," giving into his hick heritage to provide the character with a direct shot of no-nonsense backwoods justice. Matching him well is Waltz, who creates a mesmerizing study of evil in Landa, a Nazi who's always one step ahead, more interested in demonic manipulation than direct trauma. It's a chilling performance, infusing "Basterds" with real conflict and hostility that helps ground Tarantino's flights of fancy. Also scoring highlights is Laurent, who has the more silent victim role, but expresses a piercing rage as the shell-shocked young woman offered her own shot at vengeance, though not through a commonplace explosive device, but a special fate that ties into her history with the movie theater. Adding to the mix are wonderful supporting turns from Til Schweiger (as the German renegade "Shaft" figure of the Basterds) and Daniel Bruhl (playing a Nazi war hero smitten with Shoshanna), cameos from Mike Myers and Rod Taylor, and some vocal surprises provided by Samuel L. Jackson and Harvey Keitel. It's a slow tango to the final act, where everyone and everything explodes at the Nazi premiere of the propaganda film, "Stolz der Nation." The payoff is darkly magical: a cinema firefight (captured splendidly by cinematographer Robert Richardson) where Tarantino sends everyone to their endgame screaming bloody murder. It's a virtuoso spin on the ultimate showdown, playing to the filmmaker's strengths as a madman in love with poetic acts of comeuppance and botched acts of heroism. In perhaps his final offering of self, Tarantino rewrites history with "Basterds." I mean literal history, altering the fates of top Nazis to satisfy this insane revenge fantasy. By the end of the picture, Tarantino has made a convincing case for modification, rendering the elbow-glove slaps across the face of history as more of a cherry on top of this succulent strudel than a disrespectful offense. "Inglourious Basterds" is not Quentin Tarantino's finest film, but it certainly remains his most brave piece of filmmaking, skillfully riding that line between geekgasms and flamboyant historical pageantry. And any man who can worm in David Bowie's theme song for the 1982 film "Cat People" into a World War II picture instantly wins my heart. Buy tickets to "Inglourious Basterds" now!